Text: Thursd. Sept. 29 … Hearing about 7 o’clock that Garrick did Rich. III, one of his very capital characters which he has not done these 7 or 8 years, resolved (if I could get in to see him) to bear the abhorred sight of that woman-like painted puppy, the King of Denmark. After one unsuccessful attempt got into the Pit with the greatest difficulty after the 3rd Act. Garrick is inimitably great in Richard & very different from the other Richards I have seen; his expression of the dying agony of that wretch is beyond description. Some actors speak with as strong & loud a voice in that scene as if they had received no wound & were not dying. One, Lloyd, who waits on Garrick sometimes, observed that he himself says he never acted better in his life, modestly observing that something must be allowed to the improvement of his judgment. During the Dance (for there was no Farce) I was within a yard of the Danish tyrant. O Heaven! what an instance of the corruption of mankind that a great nation should submit to the will – nay, the absolute will – of a puny vicious boy, unfit to govern himself & made for the distaff (like Sardanapalus) not for the rod of power! Comments: Sylas Neville (1741-1840) was an English gentleman of unclear origins, who had studied medicine but spent much of his adult life travelling while being continually short of money. His surviving diary frequently mentions visits to the theatre in London. 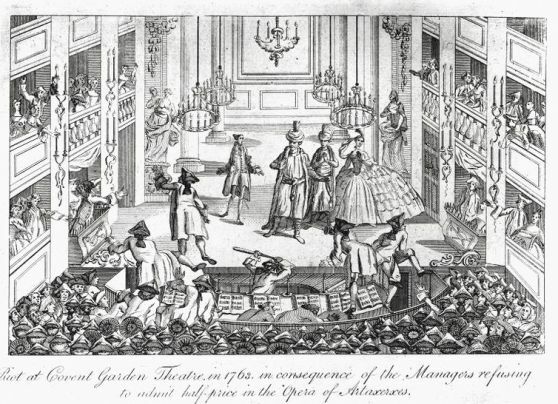 David Garrick appeared in Richard III at Drury Lane on 29 September 1768. At the end of the play there was a comic dance. Christian VII, King of Denmark, attended the performance. Sardanapalus, a legendary Assyrian king, was a byword for decadent living.